Firstly, some big news: I’ve joined the ranks of Viacom (kinda) and will now be blogging for Spike TV’s new MMA blog. It’ll go live, and the first post will be up, later today. 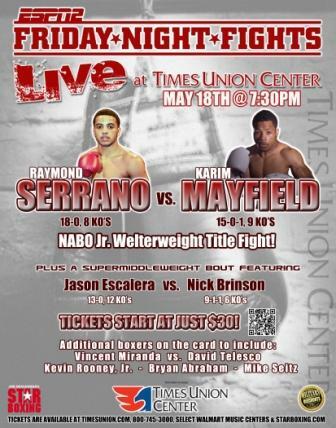 Also, tonight is Star Boxing’s second foray into promoting boxing at the Times Union Center in Albany. As an added bonus, they’ll be broadcasting live on ESPN2 for Friday Night Fights. I’ll be providing live, round by round coverage of it over on the Mixed Marshall Arts blog. Is that it for now? I think that’s it for now. My ribs still hurt but they’ve gotten noticeably better over the last twenty-four hours.